Video and Image Processing (VIP) Lab, founded in 1988, is engaged in research related to theories, algorithms, and applications of signal, image and video processing. For more information about our current research projects, see our Research page. The VIP Lab is located in 307 Cory Hall. May 18, 2017 - The Mercury News: "Avideh Zakhor:the brains behind Google Earth and Street View"
February 19, 2017 - bigthink: "Smart Tech: Phones, Drones, and Interior Mapping"
October 29, 2015 - KQED: "Mapping Your World with a Backpack"
June 8, 2015 - Berkeley Engineering: "The Mapping Backpack"
Berkeley engineering discuss our energy audit research. June 4, 2015 - BBC Arabic: "Backpack Device Performs Three-Dimensional Scanning for any Building Design"
Our lab was visited by BBC Arabic to look at our backpack scanning system. February 26, 2015 - Voice of America: "New Tool Maps Buildings' Energy Efficiency"
Voice of America shows off our latest backpack hardware at the ARPA-E summit. February 12, 2015 - BERC: "Berkeley Based Startups Win Big at ARPA-E"
Indoor Reality was among three winners of a start-up pitch competition to a panel of four investors. November 13, 2014 - SWARM Lab Seminar: "Professor Zakhor's talk on image based localization"
February 28, 2014 - U.C. Berkeley NewsCenter: "Berkeley Team Takes its Energy Innovation to Capitol Hill"
A public affairs story of our visit to a Capitol Tech Showcase, held by ARPA-E.
Energy Manager today ran a story about our latest backpack system. The Channel 2 News ran a segment for our indoor modeling project. 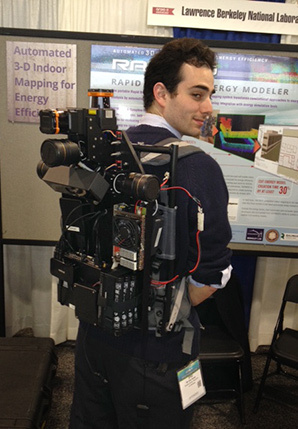 February 26, 2014 - EnergyWire: "All-Seeing Backpack Homes in on Energy Waste"
Lawrence Berkeley Lab's monthly newsletter showcased us presenting our latest hardware for our indoor modeling project. December 10, 2013 - FierceWirelessTech: "UC Berkeley Pursues Indoor Positioning Via Smartphone Photos"
This article showcases our research in positioning systems using just smartphone cameras. Veronica Belmont filmed a segment for Chevrolet covering our indoor modeling project. March 7, 2011 - Technology Review: "Turning Augment Reality into an Open Standard"
Technology Review interviewed Professor Zakhor for an article on augmented reality. For more about our image-based localization for augmented reality project, click here. January 2011 - Photonics Spectra: "3-D Interior Modeling: A Virtual Walk on the Inside"
Photonics Spectra published an article about our indoor modeling project. October 8, 2010 - North Gate Radio (KALX) Interview: "Laser Backpack: One-on-One with Avideh Zakhor"
Professor Zakhor was interviewed by Alexa Vaughn of KALX about the lab's work in indoor modeling and 4D capture. September 30, 2010 - SIGNAL Magazine: "Laser Backpack Prototype Maps Inside Buildings"
SIGNAL Magazine published an article about our indoor modeling project. 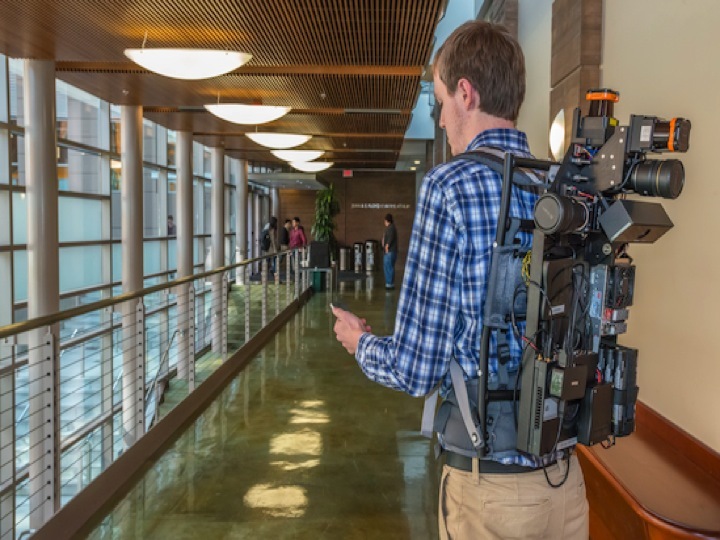 September 7, 2010 - Air Force News: "Portable Laser Backpack Revolutionizes 3D Mapping"
The Air Force Office of Scientific Research (AFOSR) published an article about our indoor modeling project. August 12, 2010 - Daily Californian: "New Backpack Makes 3D Maps of Buildings"
The Daily Californian published an article about our indoor modeling project. Recently, our indoor modeling project was profiled by Richard Hart of ABC 7 News (KGO)! To learn more about our work in indoor modeling, see our project page. Lab alum Christian Frueh writes about the highly detailed 3D building facades added to select cities in Google Earth. This technology is based off research performed in our lab for the City Modeling project. August 2007 - Air Force News: "3-D models of urban environments to aid military efforts"
The Air Force Materiel Command published an article about our City Modeling project, which is funded by the Air Force Office of Scientific Research. June 2007 - Google Licenses Our 3D City Modeling Software! Google has licensed the 3D city modeling software we developed with the City Modeling project, which provides a fully automated, fast, scalable data acquisition system and post-processing package for building photo-realistic 3D models of urban environments. January 2006 - Red Herring: "Video Search's Buried Treasure"
Red Herring published an article about our work in video search and retrieval. For more information, see our publications on the topic. May 2005 - R&D Magazine: "3D Modeling On-The-Go"
R&D Magazine wrote an article about our work on our City Modeling project. May 2005 - Future Tense Radio Interview: "3D Mapping For War Planning and Starbucks Finding"
Professor Zakhor is interviewed by the American Public Media radio program, Future Tense, discussing urban mapping and its uses. For more information about our work, see our City Modeling project page. 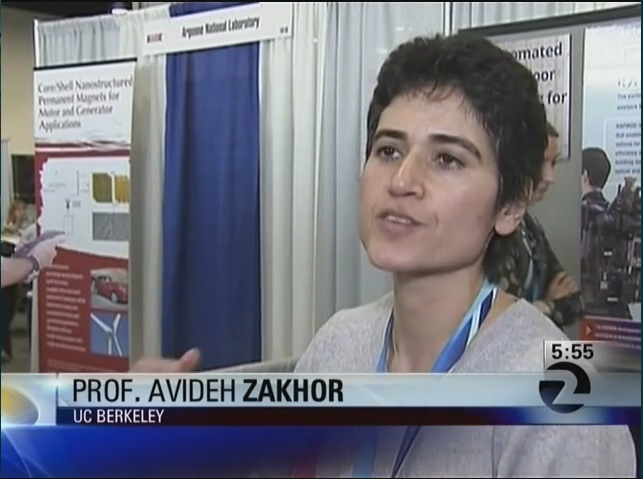 April 2005 - The Hungry Mind: "Prof. Avideh Zakhor on being a science nerd in Iran, why Larry Summers made her mad, and what the heck a 4D model is"
Professor Zakhor is interviewed. Projects mentioned in this interview: City Modeling, Video Compression. February 2004 - Daily Californian: "3-D City Modeling System Unveiled"
The Daily Californian covers our City Modeling project in this article.